Please refer to our stock # rosen25KB when inquiring. 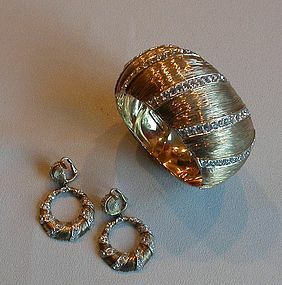 Nettie Rosenstein hinged bangle bracelet and dangle earrings, handsomely crafted as always. The set, 1940-50's, is beautifully designed, and the bracelet is heavy and chunky. As with everything we present, it is in excellent condition. The opening at the rim of the oval bracelet is 2 1/2" by 2 1/4" and the bracelet is 1 3/4" wide. The bracelet has the name plate stamped Nettie Rosenstein Sterling. The earrings are 1 3/4" long from the top of the clip. One earring has the name plate stamped the same as the bracelet.